Flickr, the world's premier photo sharing site made a major improvement to its privacy controls these past few weeks. 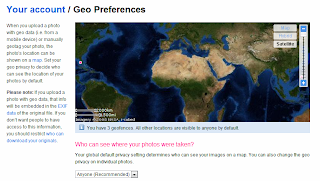 If you use Flickr and share location information of your photographs, you need to spend a few minutes and read about their new geofences privacy features. I'm glad that despite having some highly publicized lay offs , they managed to improve the site and integrate geolocation controls. The new geofences tool gives users the ability to hide location information if it is too close for comfort. For instance, you may want to remove geolocation information on your home pictures, or make sure that only your contacts or family members can see them.